Glenavon's Rhys Marshall with Ballymena's Gary Thompson during Tuesday nights Danske Bank Premiership game at Mourneview Park. 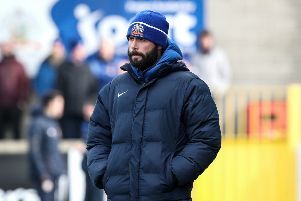 Glenavon had to settle for a point after their rearranged league game with Ballymena United finished 1-1 at Mourneview Park on Tuesday night. Despite having to come from a goal down, the Lurgan Blues will feel this was a missed opportunity as they were on top for large spells of the game but could not turn their chances into goals. There was a bright opening spell from the home side with Kevin Braniff opening up the defence with a fine crossfield pass to Joel Cooper, his cross was cut out but only to Rhys Marshall but his shot flew wide of the goal. On nine minutes Mark Sykes, playing up front, failed to connect from close in after a pass from Braniff. In the next attack Sykes struck a sweet shot which defender Stephen McBride turned behind for a corner. The good approach work continued but without any reward as Cooper, Sykes and Hall all searched for the vital opener. There was a big shout for a penalty when Sykes was floored in the box by Allan Jenkins but referee Keith Kennedy waved play on. Ballymena seemed to be struggling to get a foothold in the game but they stunned the home fans by taking the lead on 32 minutes. David Cushley took a short corner to Tony Kane and his cross fell perfectly for Johnny Taylor who fired past Johnny Tuffey. A dream start to the second half saw Glenavon level the match on 46 minutes. Cooper’s cross was met by Marshall and Ciaran Martyn was quick to force the ball home. Both Braniff and Hall both had a chance to put the Lurgan Blues ahead a minute later after Cooper’s run and low pass into the box but neither could apply the finishing touch. The home side looked the most likely to add to their tally but United came close again on 72 minutes with a warning as Jenkins nodded over from Kane’s corner. Then a mistake at the back set up Cushley but his shot was blocked and from the rebound Faulkner forced Tuffey into a save. In a late surge for all three points Glenavon were out of luck as Conor Dillon headed onto the bar and then right at the end Martyn had two chances to find the winner, first denied by the post and then by Blayney. Glenavon: Tuffey, Dillon, Marshall, Kilmartin, Cooper, Hall, Sykes, McGrory, Braniff, Martyn, Elebert. Subs: Lindsay, Patton, Kelly, Marron, McGrath.